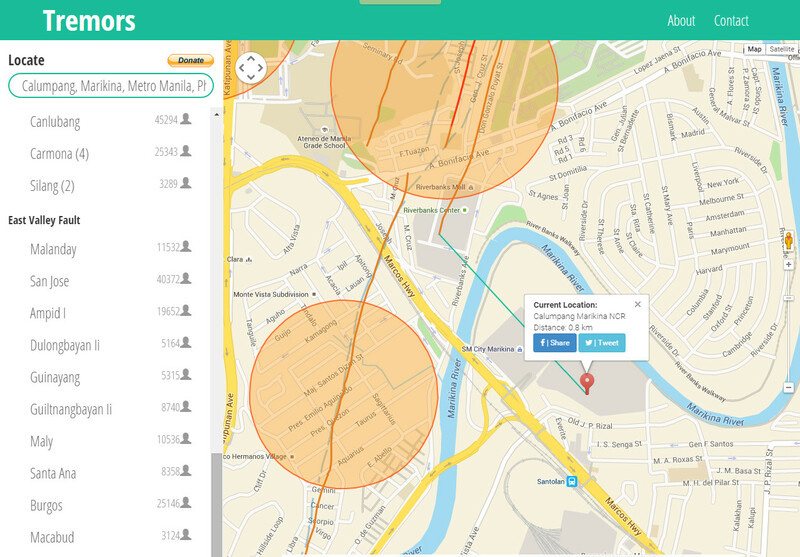 Lately, the Valley Fault System (also known as the Marikina Valley Fault System) has been in the news including locations where the Fault Line passes through. In response to providing valuable information on the Valley Fault System, a group of developers came up with an online tool that maps out the fault along with barangays and cities affected. Project Tremors is a website that uses data sources from GMA Network, ABS-CBN news, nababaha.com and Local Waters Utilities Administration (LWUA) to map out the East and West portion of the Valley Fault System. Kyle Abughanem, the website graphically illustrates the barangays affected and in the path of the fault line through a map. In addition, the barangays listed show the population breakdown. You can also search for your location and it will calculate your distance frmo the fault line.